Summary: Scott’s whole world is focussed on competing in the Tourist Trophy on the Isle of Man. Being invited to even compete was a challenge, but the most difficult part was losing his father to a random motorcycle accident before the big trip. Supported by his best friend Neil, he continues to pursue his dream, making new friends and allies along the way. But when the unthinkable happens, Scott is forced to reconsider things as his plans fall apart. Somehow he has to find a way to pick himself up again, and find the courage to accomplish his goals and take the ride of his life, with help from some very loyal friends. Review: Incredibly well-researched and detailed, TT: Full Throttle by Nicole Winters opens up the world of motorcycle racing for her readers. I’ve never been on a motorcycle in my life, but Winters’ writing helped me to see the appeal, and fostered in me respect for the people who compete in the Tourist Trophy. I identified with the athletic aspect of it all, pushing yourself beyond your limits to achieve something incredible. In the midst of the action, Winters has some great characters. My favourite was Neil because right from the start he was thoughtful and always seemed to be taking care of others before himself. You can imagine how upset I was when things transpired the way they did, and even though I knew it was wrong, I kind of agreed with Dean when he blamed Neil’s girlfriend. I liked the sub-plot of women in the motorcycling world with the fabulous character of Mags and the acknowledgement of how few female competitors there were. When I saw Winters’ picture on her website and truly realised just how much research she had done to create such a vivid portrayal of the Isle of Man Tourist Trophy, I wondered if she ever thought she might like to compete herself. When it comes to the race itself, I loved that Winters’ writing mixed the believable with a little bit of fantasy. Would a major champion of the TT take the time to show Scott the course? Maybe not. But I liked that it wasn’t an unbelievable, newcomer to what seems like the most dangerous race in the world, takes first prize kind of deal. The best part is that the TT is real, and Winters is actually attending it right now to research another book. Can’t wait to see what she comes up with. Scott, the main character, is actually twenty-two in the book, but he seems more like a sixteen year-old. 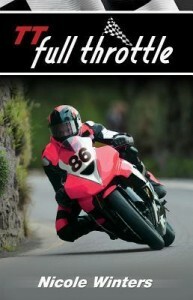 This makes TT: Full Throttle a great book for reluctant readers, because along with Scott’s determination and the fast-paced world of racing it is an involving, relatable read. She takes both of my hands in hers. ‘Have you told him that? Maybe you should. He’s never outright said it, but …’ Her voice trails off. TT: Full Throttle by Nicole Winters is published by James Lorimer & Company Ltd, (2013).